The 1st International Spinal Cord Meeting is organized by Step by Step Foundation, a non-profit organization dedicated to innovative physical therapy for patients with spinal cord injuries in Barcelona. The Foundation’s principal objectives are the treatment of spinal cord injuries and research for a future cure. The recovery center at Step by Step is the first center in Europe to incorporate the methodology and equipment of the US based organization, Project Walk, a pioneer and leader in this innovative treatment with more than 10 years of experience. With the creation of a scientific committee, it is the Foundation’s wish to instill initiative and advancement towards a possible cure from spinal cord injuries. 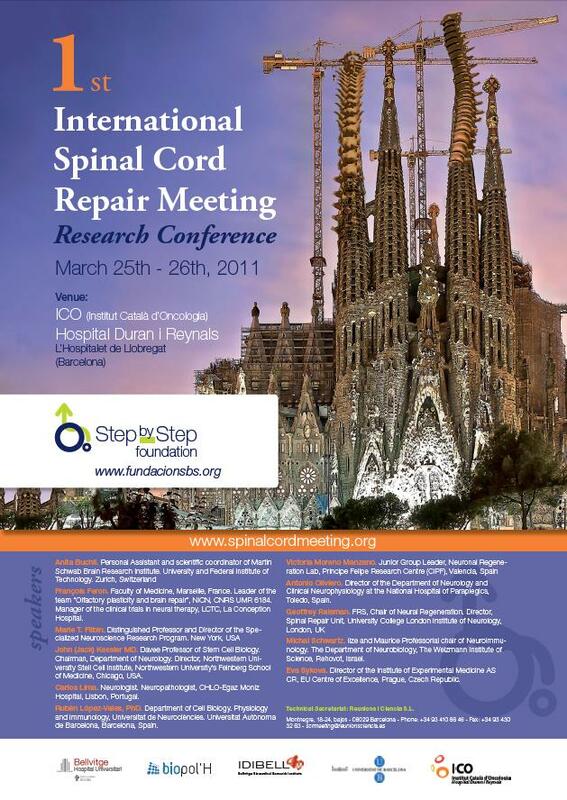 The 1st International Spinal Cord Meeting was celebrated in Duran and Reynals Hospital in L’Hospitalet (Barcelona). The conference was inaugurated by Ms. Núria Marín, mayor of Hospitalet, Dr. Carles Miquel, Head of Research at the Ministry of Health of the Generalitat of Catalonia, Dr. Xavier Corbella, Director of Bellvitge Hospital, Mr. Frederic Crespo, Founder and President of the Step by Step Foundation and Dr. Filip Lim, member of the organizing committee. There were two days where doctors presented and talked about the latest developments in the treatment of spinal cord injuries. On the last day the conference of the 1st Spinal Cord Meeting was closed with the participants’ proposal to maintain contact to establish future collaborations which they expect to be highly fruitful, and to encourage the exchange of information. In the end, all of this is to achieve whatever possible, the principal objective which drives us all: to find a treatment which is so much needed by the patients.